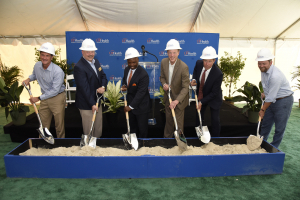 One year ago, UF Health and the University of Florida were selected to provide medical and wellness services to Wildlight, a master planned community just east of Interstate 95 at the A1A exit. The medical office building is UF Health and UF’s first step in bringing health care and healthy living to Wildlight. The second facility, the UF Health Wellness Center, will be a 35,000-square-foot building that will include UF Health rehabilitation services and a YMCA. One of Wildlight’s key objectives is to create a community where people can live, work and play in a dynamic environment. An individual’s health and well-being, which includes the mind, body, spirit and social aspects of life, are essential elements. UF will provide the breadth of knowledge, talented faculty and resources to ensure healthy living is integrated into the fabric of the Wildlight community through healthy habits, education, fitness and recreation programs. The University of Florida is a major public land-grant research university. The state’s oldest and most-comprehensive university, UF is among the nation’s most academically diverse public universities. UF traces its beginnings to a small seminary in 1853. It opened its doors in Gainesville in 1906 with 102 students. Today, it has an enrollment of some 52,000 students annually. UF is home to 16 colleges and more than 170 research centers and institutes and offers nearly 300 graduate degree programs. Only five other universities nationwide have as many programs of study on one campus as the University of Florida. UF has a long history of established programs in international education, research and service. It is one of only 17 public, land-grant universities that belong to the Association of American Universities, the higher-education organization comprising the top 62 public and private institutions in North America. UF is consistently ranked among the nation’s top universities. UF has nearly 5,000 faculty members with distinguished records in teaching, research and service, including 37 eminent scholar chairs and 42 faculty elections to the National Academies of Sciences, Engineering and Medicine, and the American Academy of Arts and Sciences. Awards include a Fields Medal, two Pulitzer Prizes, NASA’s top award for research, and the Smithsonian Institution’s conservation award. UF Health is the Southeast’s most comprehensive academic health center. With main campuses in Gainesville and Jacksonville, UF Health includes six health colleges, eight research institutes and centers, two teaching hospitals, four specialty hospitals and a host of physician medical practices and outpatient services throughout North Central and Northeast Florida. Its mission is to promote health through outstanding and high-quality patient care, innovative and rigorous education in the health professions and biomedical sciences, and high-impact research across the spectrum of basic, translational and clinical investigation. UF Health includes the UF colleges of Dentistry, Medicine, Nursing, Pharmacy, Public Health and Health Professions, and Veterinary Medicine, which has both a large animal hospital and a small animal hospital. The system also encompasses several UF research institutes and centers. The full spectrum of patient-care services are provided through UF Health Shands Hospital and UF Health Jacksonville, UF’s private, not-for-profit affiliates. UF Health Shands Hospital in Gainesville includes UF Health Shands Children’s Hospital and UF Health Shands Cancer Hospital. Four additional specialty hospitals, the UF Health Heart & Vascular Hospital, the UF Health Neuromedicine Hospital, the UF Health Shands Rehab Hospital and the UF Health Shands Psychiatric Hospital, are also in Gainesville. UF Health Jacksonville and UF Health North Hospital are the system’s Northeast Florida hospitals. UF Health offers a network of outpatient rehabilitation centers, two home health agencies in Gainesville and Jacksonville, and more than 100 UF physician outpatient practices throughout North Central and Northeast Florida. Wildlight is envisioned as a new town inspired by a character, culture and pattern of living that we call “Florida Lowcountry,” where play is a part of every day and the natural world is a natural part of life. The plan for Wildlight includes a mix of homes, townhomes and rental apartments together with businesses, shops and restaurants, a new elementary school and a system of connecting trails and pathways intended to promote a walkable community and healthy lifestyle. Our Phase 1 plan is flexible and currently designed for about 1,000 homes throughout 260 acres, approximately. In addition, the community will have approximately 350 acres of permanently preserved open space. Wildlight offers comfortable and friendly Florida Lowcountry living located 20 miles north of Jacksonville and just east of Interstate-95 on A1A. There is easy access to both Amelia Island and the Jacksonville International Airport. Wildlight is being created by Raydient Places + Properties, a taxable subsidiary of Rayonier Inc., a real estate investment trust. For more information please visit Wildlight.com.